The community fridge is now open for business at Eyemouth Community Centre. Eyemouth’s determination to become a zero food waste town has taken a step forward with the commission of the Eyemouth community fridge. Based in the town’s community centre the fridge is stocked with food from local shops on a daily basis that might otherwise have been thrown away. 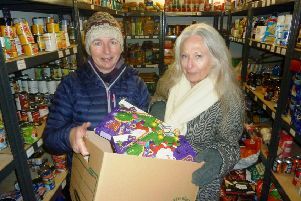 A team of 15 volunteers pick up the food and anyone who has food they cannot use is being encouraged to bring it along to the fridge to share with others. Eyemouth Community Council chairman James Anderson explains: “The project is an example of different groups working together and four groups were involved: the community council, Splash, community centre and NHS Borders. “Funding was gained by community councillor Jan Weeks and within five weeks of the project being envisaged a fridge was delivered to the community centre. “We have weekly deliveries from local vegetable growers to add to what the fridge can offer. “It is yet another example of the community working together and the positive outcomes that can happen when people have a common goal. “We already have regular users but it would be great if everyone got on board to stop food waste. “But we want to get across the message to the public that this fridge is not a food bank. “If you have too much at home then why not donate it to reduce waste. !This project sees everyone benefit, young and old, rich or poor it doesn’t matter. “I’m incredibly proud of the people who worked together to make this happen. Eyemouth Rainbows and Brownies were given a talk about the community fridget this week and who can use it. If anyone wants to get involved with any of community council projects please email eyemouthcc@outlook.com or drop into Splash on Harbour Road.